STEP 1: Check that you meet our Adoption Criteria and that you agree to our terms and conditions. Kittens to homes with children under five years old, we will review each case individually so please don’t be put off by this. Kittens before they have been vaccinated, chipped and spayed / neutered before homing. However the adoption process can be done beforehand and kittens reserved so that they can go to their new home as soon as they are old enough. If the cat needs to be an ‘indoor cat’ (eg for medical reasons) then your house should have a porch or similar ‘airlock’ (ie so that when you open the front door, the cat cannot slip out). We will also not home indoor cats to smoking homes due to the negative health impacts. That you acknowledge adopting the cat(s) and accept that their welfare and any costs incurred are now your responsibility. That you have never been banned from keeping animals by any court of law in any country. That if the cat(s) require veterinary treatment to maintain their well being, you agree to obtain and meet the costs of such treatment. That you agree not to have the cat(s) put to sleep without notifying CCG unless it is on urgent humane grounds. That if the cat(s) are lost, you agree to contact CCG as quickly as possible. That you agree to allow a member of CCG to check on the cat(s) progress by appointment and at reasonable times. You will be asked to give us an Adoption fee: a MINIMUM of £75 per cat or kitten. Where a kitten is not yet ready to go to a new home you can reserve a kitten, we will ask for a non refundable deposit of £50, the balance is payable on collection of your kitten/s. This covers the cost of neutering / spaying, micochipping, vaccinating, de-worming and de-flea-ing a cat while it is in our care, all of which will be noted on the Vet card that comes with your Adoption paperwork. It doesn’t cover the cost of cat food / litter / vets bills / medicines / beds / scratchposts etc, or our Centre running costs such as heating for the pens. On average, we care for between 70-90 cats at any one time (cats for re-homing plus ferals and permanent fosters – ‘Golden Oldies’ or ill cats) – so our weekly running costs are high and our volunteers have to do a lot of additional fundraising throughout the year. So…. please do not ask us to reduce this £75 adoption fee, even if you are adopting more than one cat. If you can donate more we will ask you to kindly complete a gift aid form if you are a UK taxpayer, as this will add 25% to your donation. As a small, local charity we receive NO funding other than donations from the public, and we rely very much on the goodwill of our volunteers and supporters. Once you have agreed to the above terms, please read the information on our Cats page, which contains photos and information about the cats that are currently available for adoption. We try to keep this information as up-to-date as possible, and we also post information regularly on our Facebook page. 1. If adopting 2 kittens, try to adopt kittens from the same litter who enjoy each other’s company. Because they have known each other their whole lives they usually settle into their new home without squabbling. 2. 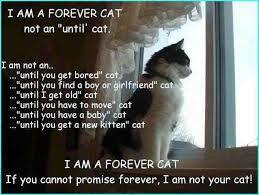 If adopting more than 1 cats, please choose cats who are bonded to each other. It is less stressful to adopt adult cats who are already best buddies than to integrate an unfamiliar cat with the resident cat. One of the upsides to adopting bonded friends is that they usually transition to their new home faster, with minimum anxiety. If bonded pairs are separated they can often grieve for the loss of their best friend. 3. Adopt cats who are the same age and activity levels. It usually works best to introduce cats to each other who are around the same age and have the same energy levels. Bringing home a young kitten to keep an older adult cat company often leads to problems. The kitten wants a buddy to incessantly play with, while the older cat would rather quietly nap by the window. Adopting 2 kittens is better as they keep each other occupied! Please complete the adoption form for all homing enquiries. The adoption enquiry form goes directly to our Homing Coordinator who is the person responsible for matching applicants with suitable cats / kittens. STEP 4: Home Visits and Adoption paperwork. We hope to provide all our cats with good new homes, therefore a home visit is required for all cats, even for people known to us. Please don’t worry about this – it is just for us to make sure that your house is suitable and safe for the particular cat you have chosen. This restricts adoptions mainly to Coventry CV postcodes, as we are all volunteers and so time and petrol money are a factor in how far we can rehome. We can sometimes rehome to further afield if a home visit is possible for a volunteer, but we cannot guarantee this, sorry, it depends where you live and whether someone is going that way! STEP 5: Visit the cat(s). Once your application has been accepted, we will contact you to arrange for a time for you to visit and meet the cat(s); we like to see any children at this point to see how they interact with the cat. You should take your time with this meeting and spend as much time getting to know the cat as possible as it is a new family member who may well spend the next 20 years with you! STEP 6: Welcome your new ‘Forever Cat’ to your home! Pet medical insurance – recommended once the cat is in your care. Please choose your policy carefully to ensure that it meets your needs as policies can vary a great deal (eg general medical bills, accident/injury insurance, dental work, boarding fees if you are in hospital and so on…). Policies start from around £4 a month. Vaccinations: Your cat has been vaccinated but will need a booster every year for the rest of their life. Vaccinations are vital as they keep your cat safe from harmful diseases, and if you board your cat while on holiday you will need to show an up-to-date Vaccination card. Spaying/Neutering – this has already been done, but if you have other cats who are not neutered please see our separate section! Worming: Your cat has already been wormed by us, but it is important to worm your cat every 3-6 months. Take your cat to your vet for worming tablets and they will show you how to give your pet their medication. Kittens need to be wormed more frequently, every 2 weeks until 6 months of age, then monthly from 6-12 months. De-flea: Your cat has already been de-flea’d. It is recommended to de flea your cat every 1-3 months depending on the product used. Again have this treatment carried out by your vet as they use effective de fleaing products. Using a vet-bought de-fleaing treatment is much more effective and cheaper in the long run than using a non veterinary approved treatment like a flea collar. Microchipping: All our cats are automatically microchipped to the Coventry Cat Group and you will be given the chip number with your adoption paperwork. It is vital that contact details are kept up-to-date if you move house or change telephone number, as many of the cats in our care cannot be reunited with their owners due to incorrect microchip details. When you take your cat to see your vet for check ups, boosters etc ask your vet to scan for a micro chip to make sure the chip is still active and hasn’t moved down the cats body and to register the microchip number on your pets records. We are happy to amend these details on adoption to register the cat to the new owner but ask that we be kept on as backup. We cannot stress enough the importance of microchipping cats, and keeping those details up-to-date! Important: Please keep your new cat indoors for at least one month, longer if possible, to prevent them from straying. By keeping your new cat indoors for at least 4 weeks they will identify your home as their safe territory. Many cats let out before 4-6 weeks are likely to stray – some looking for their previous home. Thank you for choosing to adopt from Coventry Cat Group! By adopting from us you are not encouraging those people who allow their cats to have kittens as a way of making money (which is a cause of the current cat overpopulation problem). You also have the reassurance that we will take the cat(s) back if you cannot keep them – not always immediately, but as soon as we can. All of our cats, unless stated otherwise, are healthy as far as we know, but please understand that these are rescue cats which come to us with an unknown history in many cases. If a cat has an identified pre-existing health condition prior to adoption we may be able to help with vets bills within the first 6 weeks as long as this is discussed with us before treatment commences (dental work is exempt from this). If you, or someone that you know, are looking for a new cat please consider adopting from a rescue such as ours, rather than buying a cat or kitten privately or online.